Farmhouse: Built in 1917 and renovated in 1990 and 2005, the two story house includes a large kitchen and comfortable living room. 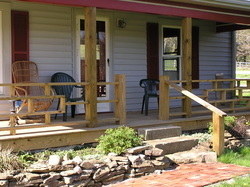 An open deck and backyard add more space during warm weather. The kitchen is available to caterers for any events on the farm. There are 1.5 baths and 3 rooms upstairs. Pavilion: This open-sided 40x60 building can hold up to 200 people for a seated dinner or even more without tables. It overlooks the garden and woods surrounding what we call the “back field”. The setting is secluded yet easily accessible by vehicles. There is a stage which can be adjusted to different sizes; electricity is available and a water hydrant is nearby. Canvas tent sides can be closed for a little extra warmth and windblock on cool or windy days. Also located near the pavilion is a children’s playground, a flat area suitable for games, and a bonfire site. General Store: The hand-built cedarwood store is the place to find some of our farm products plus snacks, drinks, ice and camping supplies. It is only open for large events, but the fridge in the store is available for use for smaller events as it is conveniently located near the Pavilion. 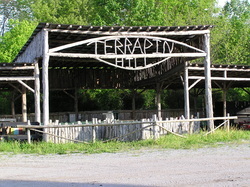 Stages: The Terrapin Stage is a full-size stage (25'x30') with unlimited seating capacity on “Terrapin Hill”, also known as "the knob". It was designed and hand-crafted by Pete and friends in 1997 with cedar logs harvested from the farm, and has since hosted many local and nationally-known music acts. 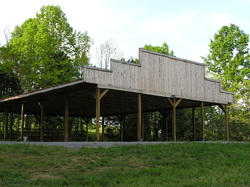 The gravel arena it sits on can also serve as a parking area for events held at the Pavilion. 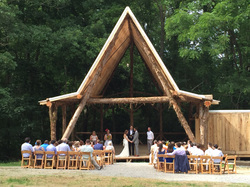 The Chapel Stage is in a beautiful, intimate setting surrounded by tall trees. The gently sloping field provides an excellent view of the stage and even includes a bonfire site. 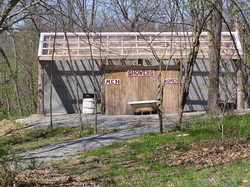 Showerhouse: The showerhouse brings an added dimension of camping comfort for Terrapin visitors! Each separate area for men and women has 3 shower stalls and 2 sinks with unlimited hot water. Drinkable water is also available at a hydrant nearby. Gardens and Greenhouse: Catered meals for weddings and other events often include food that is raised right here on the farm. Camping: We always encourage camping out at the farm, especially for multiple-day events or for those truly wanting to “get back to nature”. The 400-acre farm offers unlimited camping sites, but we have a few recommendations depending on the size of the group and how near you want to be to other facilities. Bring your own tents, or rent our 24' teepee (sleeps up to 6 adults). We also have six RV sites with water and 30amp electric hookups, and two other sites with 30amp electricity only. Natural Resources: The farm has a beautiful and varied natural topography that we encourage visitors to take advantage of. 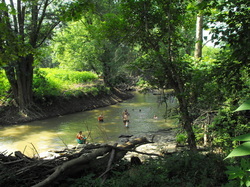 Over a mile of the Chaplin River flows through the farm and is navigable by canoe or kayak at most times of the year. At least half of the farm is covered in hardwoods with numerous hiking trails. Fishing is allowed in the pond and river; swimming is at your own risk. Hay rides down the river valley are a great way for groups to experience parts of the 400-acre farm few people get to see.